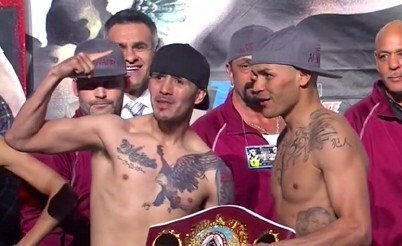 Brandon Rios vs. Mike Alvarado II – “The Boys are Back"
This coming Saturday evening, let us be collectively thankful that we as the boxing faithful can experience a headache to remember. Hopefully, such a careening of the cranium is felt more in the style of Cheech and Chong’s “Corsican Brothers” as we once more pull up to the TV (or some luckily enough in person) to witness either round one or maybe round eight in the memorable war that was Brandon “Bam Bam” Rios versus “Mile High” Mike Alvarado. The two battle hardened warriors met last October for a thundering clash in one of the sport’s gold standards of divisions, the junior welterweight class. They participated in a seven round, back and forth, see-saw type match-up which had just about everything for which dedicated fight fans clamor. The two pugilists stood toe to toe during many points of the bout and two of the three ringside judges saw the bout even until “Bam Bam” Rios (31(23)-0-1, Oxnard, CA.) proved too much for “Mile High” Mike (33(23)-1, Denver, CO.) to handle, which resulted in a stoppage of the action at the 1:57 mark of the seventh round. As the case has been for many years now, a fight which in turn becomes highly memorable for all the right reasons or even better still is a valid candidate for fight of the year, the scene for a rematch warrants a bigger stage. Case in point is this Saturday night. From Carson, California (where the first match took place) to the fast and furious of Las Vegas and now it’s on….again. With all due respect to Juan Manuel Marquez’s monumental knockout victory over Manny Pacquiao last December, please consider this thought. The focus was perhaps not simply placed upon the win itself, but rather who was in fact sent to the canvas for pugilistic nap time. Most professional fighters who carry at least a chickpea’s worth of common sense are aware that every opponent should be treated with respect. They understand that a single punch can change everything. Try if you will to apply such reasoning to Pacquiao/Marquez IV. When Brandon Rios faced Mike Alvarado last fall, an interesting enough story had unfolded for each fighter. Rios was just six months removed from a highly controversial win over Richard Abril, which was a result many if not all boxing pundits agreed that Rios had lost. Alvarado, by contrast had been quietly racking up the knockout victories for his resume and had last participated on the undercard of the aforementioned Rios v Abril contest. The commonplace trend in professional boxing is to let two fighters strengthen their respective resumes as opposed to immediately facing off once again in a rematch. However, such an opinion is shared by neither Rios nor Alvarado. Mike Alvarado’s opinion was just as blunt. As of right now, a $400 bet on Brandon Rios would net $100 for a win, while “Mile High” Mike is the clear underdog with a $100 wager which could bring in $300. The oddsmakers aren’t always right and they’re usually no fans of the sport. This fight could very well be “must see TV again”, if there is such a thing. Hopefully, as we are now victims of our own technology the news of a barnburner won’t travel too fast for its own good. Perhaps the reason such classics as Dempsey/Tunney II, Louis/Schmeling II and others hold such a profound resonance over bouts of later years are due to the fact that news traveled much slower at the time. Such mediums of communication as radio and newspapers were in use and highly appreciated. Now everyone can have an instant opinion spread around the globe. Conversely, an all out slugfest can be just as visually entertaining as a classic example of full utilization of the sweet science in the form of a chess match.